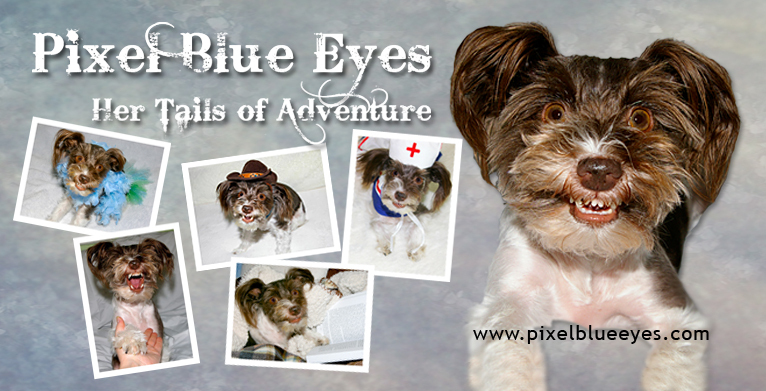 Pixel Blue Eyes is an 8 year old female miniature Schnauzer who loves bringing joy and happiness to everyone around her. Pixel is a blogger, trick dog, adventurer, nurse, inventor, poet, and animal advocate who has been writing along side her Mommy Jenny Lewis. Pixel knows over 20 unusual tricks and commands and loves practicing them with her Mommy and writing partner Jenny Lewis. 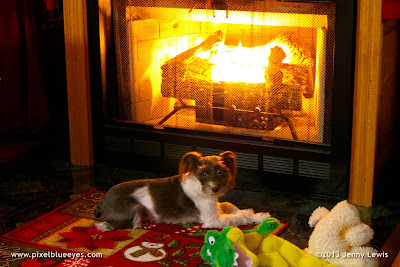 Pixel is the creator of the entire "Pixenator 5000" series of special inventions for dogs, including the Pixenator 5000 Personalized Fave Toy Living Blanket Heat Generator and the Pixenator 5000 Toy Holding Utility Collar. She is also a great outdoor adventurer who is not afraid to try new things, such as the time she decided to "try her paw" at being a survivalist or when she braved the great Arctic Tundra. 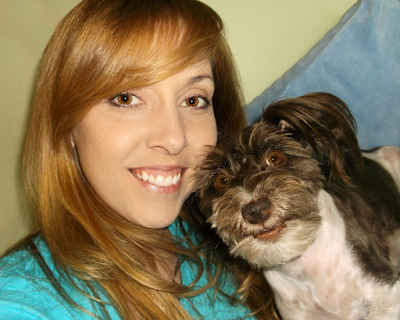 Jenny was in her last semester of college in 2008 and had just lost her first dog of 15 years when Pixel stepped into her life, stole her heart and helped her heal. Jenny earned her Bachelor of Science degree in Digital Media that year and began doing freelance work as a graphic and web designer for small businesses. 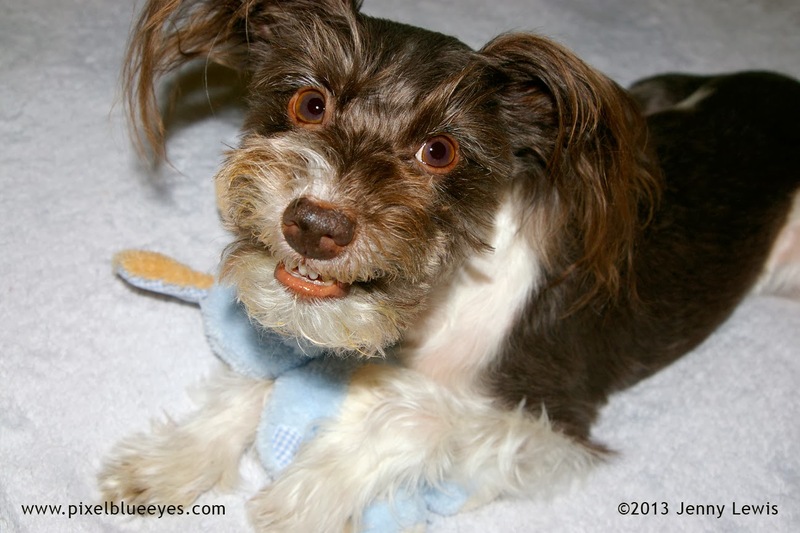 Jenny, an avid photographer for over 20 years, loved taking photos of Pixel every chance she had. She was captivated by Pixel's charming smile, affinity to learn lots of tricks, and amazing photogenic face. It was very clear that Pixel had her own voice and it needed to be shared with the world. But Pixel was just a puppy and the internet was so huge....what was a little dog and her Mom to do? 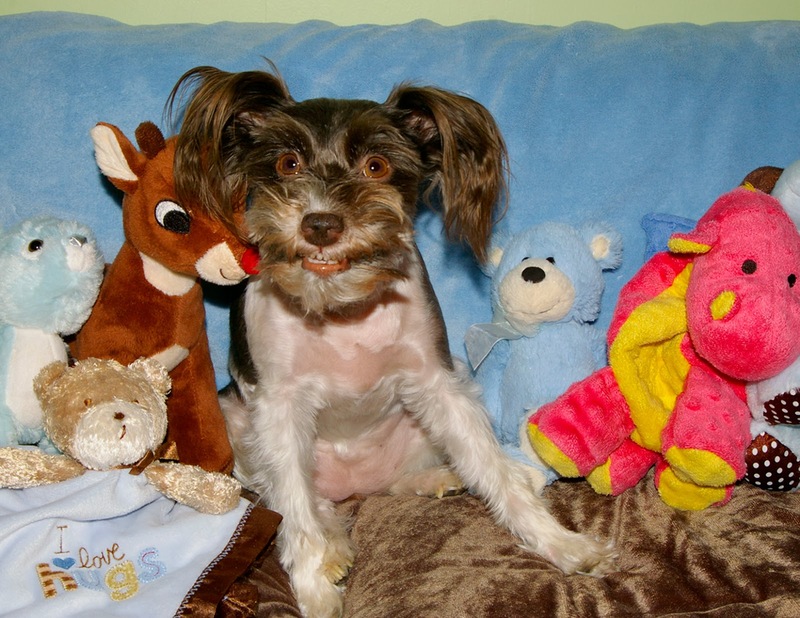 Pixel discovered shortly after adopting her Mommy that she had a smile deep within that her Mommy brought out. Pixel also discovered that she had a strong aptitude for learning lots of tricks. As Pixel and her Mommy discovered these wonderful traits, she found herself getting into little "adventures" as she discovered the world around her. Pixel, in turn, could bring joy to others as well. This new found realization gave Pixel the confidence to ask her Mommy to help her start a blog, so she could share her 'Tails of Adventure', her many smiles and some of the things she's learned along the way, with others. Pixel started sharing her adventures and stories on her blog at the tender age of 9 months old and has been winning over the hearts of people from all over the world ever since. Pixel documented her very first adventure back in September 2008. 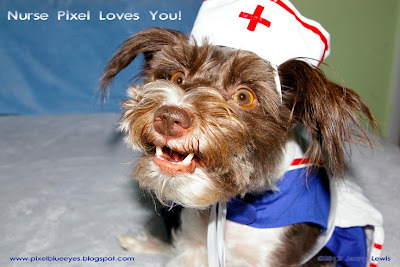 After a couple of years, Pixel started connecting with other pet bloggers. 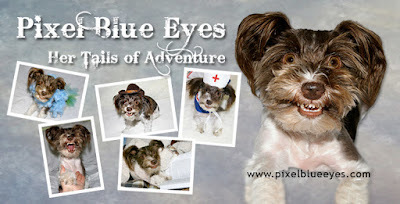 She learned a great deal from these talented friends, connected with BlogPaws organization and started working with pet brands as her Pixel Blue Eyes blogging business grew. Pixel has always believed she could bring joy to others. She cares for those around her and wants to share her joy, encouragement and comfort with family, friends and fans. One of the reasons that Pixel is so compassionate and is such a wonderful nurse and animal advocate, is that Pixel has her own share of medical issues and struggles. Pixel suffers from chronic nerve pain and damage from her docked tail, which was done at some point when she was a very young puppy. Her tail pain is manageable though, thanks to the care of a wonderful vet, surgery in 2012 and medication. Pixel also has liver damage, seizures, and some neurological damage from a 12' fall several years ago, yet she is a resilient, loving, extremely talented little pup. Through the love of her Mommy and family, she has a wonderful, full life filled with lots of joy and love. Pixel is a shining example of how someone can have a great deal of adversity in life, yet still celebrate life and spread joy to others. 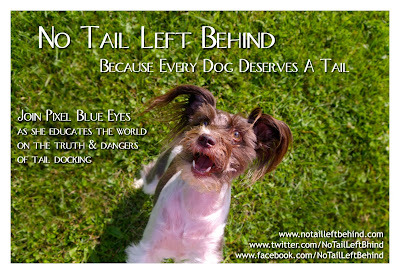 As a way to help bring awareness to the dangers and long term effects of tail docking, Pixel and her Mom Jenny created the educational campaign "No Tail Left Behind" online that includes Facebook, Twitter and Instagram pages, as well as a No Tail Left Behind blog. Her campaign provides information, research and helpful support to pet parents, rescues and veterinarians. It continues to gain a great number of supporters and has helped many other dogs like Pixel and their families get the help they need to address the painful effects of tail docking. Included in the ranks of supporters are a number of breeders who no longer dock their puppies' tails because of what they've learned, veterinarians who refuse to dock puppy tails because of the cruelty it entails, and hundreds of pet parents who have dogs who suffer from the long term ill effects of tail docking...just like Pixel. 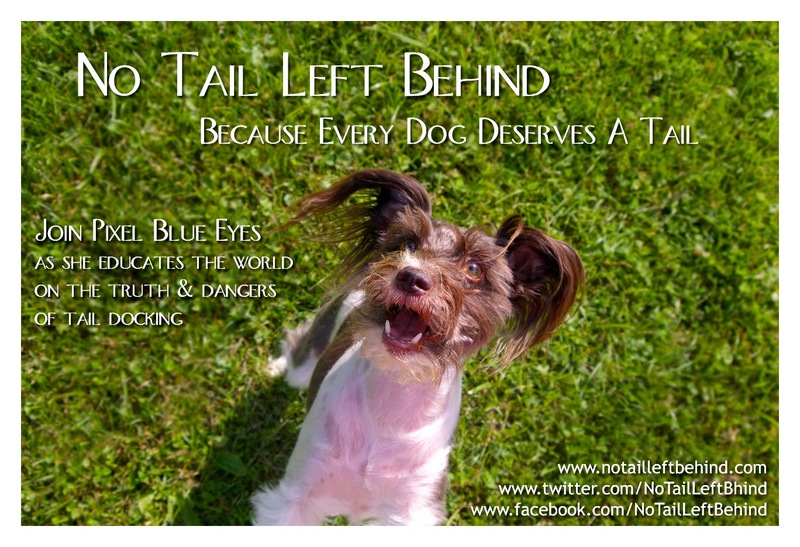 Pixel is the face and spokesdog for No Tail Left Behind, a role she takes very seriously. Her ultimate goal for her campaign is to one day help end the practice of tail docking forever; because, as her campaign slogan states, "every dog deserves a tail". In Pixel's off time, she loves playing with her sisters Peanut Pumpkin Pie, Dixie Mae Doxie, Bella Boo, and Sassy, spending time with her family, dancing with her Mommy, practicing her many tricks, creating new fun games with her toys, and lounging in front of the fireplace. She also loves running errands with her Mommy and riding in the car. Pixel says there's nothing quite like falling asleep to the gentle hum of the engine and the lull of riding down the interstate. If you're not a friend of Pixel's already, I invite you to become one! Give her a "LIKE" on her Pixel Blue Eyes Facebook page, read her blog, view her Pixel YouTube videos, and follow her Pixel Twitter, Pixel Instagram and Pixel Pinterest accounts. It will be a wonderful addition to your day! To contact Pixel and her Mom Jenny for work or just to say hello, email them at the following address: pixelblueeyes(.)blog@gmail(.)com. Just be sure to take out the parenthesis before you use the address (were are trying to avoid auto-spammers). Thanks friends! Hi Michelle and AHELP! It is so nice to meet you! I will be sure to come and visit your blog and Facebook page. I love making new friends and love what you do to bring caring help to those who are ill.